Professor Bowman received an undergraduate degree in biology from the University of North Carolina at Chapel Hill and carried out his graduate research in molecular biology at Princeton University. During his Ph.D., he studied actin binding proteins and an enterotoxin from rotavirus using X-ray crystallography. He continued a focus on structural biology as a postdoc in the laboratory of John Kuriyan at UC Berkeley, where he solved the structure of the eukaryotic clamp loader RFC complex bound to the PCNA sliding clamp. 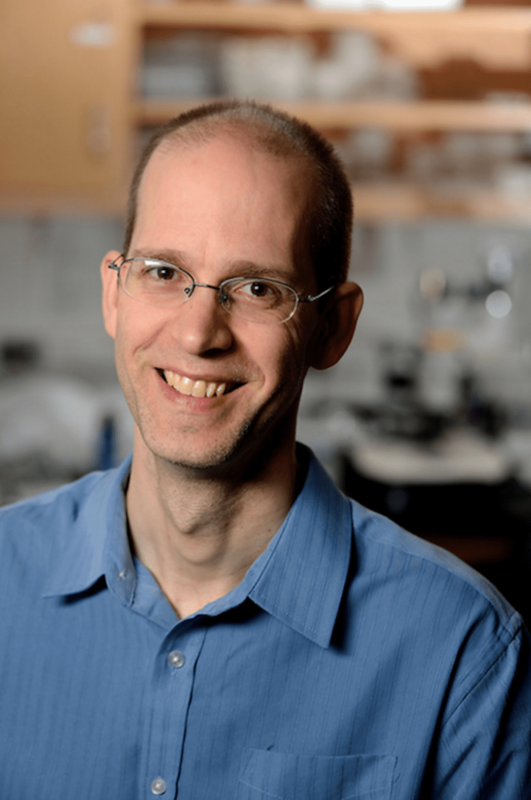 He joined the faculty of the Biophysics Department at Johns Hopkins in 2005, where his group’s focus has been on the structure and mechanisms of chromatin remodelers. Nucleosomes are the fundamental packaging unit of eukaryotic genomes, and are therefore tightly integrated into basic cellular processes such as DNA replication, repair, and gene regulation. Consisting of a core histone octamer wrapped by ~146 bp of duplex DNA, nucleosomes not only compact large DNA segments to fit into small spaces, but provide a rich medium for storing epigenetic information that is necessary for cellular identity. In order for cells to properly establish and maintain particular chromatin signatures, nucleosomes must be dynamically assembled, disassembled, and repositioned by so-called chromatin remodelers. Chromatin remodelers are multi-domain proteins and protein assemblies that use a common ATP-dependent motor domain to break histone-DNA contacts. Although it has been established that these ATPase motors are DNA translocases, it is unclear exactly how this motor is employed to reorganize nucleosome structures, and how the motor communicates with other domains to control when and where the remodeler is active. We are interested in understanding the mechanism by which nucleosomes are shifted along DNA, and how auxiliary remodeler domains regulate and direct action of the core ATPase motor. Our studies have focused on the Chd1 remodeler, and we have used a combination of crystallography and biochemistry to better understand how different remodeler domains interact with nucleosomes and each other. A crystal structure of the chromo-ATPase portion of Chd1 revealed an unexpected inhibitory role of the chromodomains. Current efforts are focused on what stage(s) of the remodeling cycle chromo-regulation occur, and how inhibition influences the outcome of the remodeling reaction. In addition, we have generated several hybrid remodelers with foreign, sequence-specific DNA binding domains, which have offered insight into how a DNA binding domain may serve as a DNA sensor and bias the direction of nucleosome sliding. This class, referred to as “computer bootcamp,” gives students hands-on experience in scripting with Unix, Python, and Mathematica. It is geared toward first-year graduate students, and no prior programming experience is required. The goal is for the students to become computationally independent: that is, to be able to ask their own questions through script writing rather than being limited by existing computer programs. Classes are presented as interactive computer labs, where students are given time to work through exercises in class, with short lectures and some group discussion to help those less familiar with programming. The goal of this course is to introduce some fundamental aspects of protein and nucleic acid structure/function/energetics, using papers from the primary literature. This course is intended for first year graduate students, and each class consists of a 15- to 30-minute lecture, followed by a discussion of assigned papers. Students are expected to be able to explain experimental design, the results, and implications of the studies. An overall goal of the course is for students to gain experience and confidence in reading and evaluating scientific papers. To additionally stimulate students to clearly and concisely explain scientific ideas and data, late in the semester each member of the class presents a short talk on a topic not covered in class. Another component of the class are weekly problem sets (on assigned reading), which also present a python programming problem based on a molecular structure. Students without prior programming experience are expected to take Introduction to Computing (250.649). This is an upper-level undergraduate course that is based heavily on assigned papers from the primary literature. Each class is centered around a structure or class of structures involved in transcriptional regulation (e.g. the nucleosome, RNA polymerase, RNAi machinery, helicases). To prepare for each class, the students are given an assignment where they must use the Pymol graphics program to visualize and answer questions about macromolecular structures. In class, I use Pymol to illustrate structural concepts and lead a seminar-style discussion through several scientific papers. At the end of the semester, each student writes a 20-page paper and gives a class presentation on a new topic not covered in the course. Overall, this class is designed to not only give students an in-depth understanding of several key topics in the transcriptional field, but help them transition to a graduate-level ability of reading and extracting information from scientific papers. Nodelman I.M., Bleichert F., Patel A., Ren R., Horvath K.C., Berger J.M., Bowman G.D. (2017) Interdomain communication of the Chd1 chromatin remodeler across the DNA gyres of the nucleosome. Mol Cell. 65(3):447-459.e6. Winger J., Bowman G.D. (2017) The direction that the Chd1 chromatin remodeler slides nucleosomes can be influenced by DNA sequence. Journal of Molecular Biology. 429(6):808-822. Levendosky R.F., Sabantsev A., Deindl S., Bowman G.D. (2016) The Chd1 chromatin remodeler shifts hexasomes unidirectionally. eLife 2016;10.7554/eLife.21356. Nodelman I.M., Horvath K.C., Levendosky R.F., Winger J., Ren R., Patel A., Li M., Wang M.D., Roberts E., Bowman G.D. (2016) The Chd1 chromatin remodeler can sense both entry and exit sides of the nucleosome. Nucleic Acids Res. 44(16):7580-91. McKnight J.N., Tsukiyama T., Bowman G.D. (2016) Sequence-targeted nucleosome sliding in vivo by a hybrid Chd1 chromatin remodeler. Genome Res. 26: 693-704. Bowman, G.D., Porier, M.G. (2015) Post-Translational Modifications of Histones that Influence Nucleosome Dynamics. Chem Rev. 115(6):2274-95. Nodelman, I.M., Bowman, G.D. (2013) Nucleosome sliding by Chd1 does not require rigid coupling between DNA-binding and ATPase domains. EMBO Reports, 14(12):1098-103. Patel, A., S. Chakravarthy, S. Morrone, I.M. Nodelman, J.N. McKnight, and G.D. Bowman. (2013) Decoupling nucleosome recognition from DNA binding dramatically alters the properties of the Chd1 chromatin remodeler. Nucleic Acid Res. 41:1637-1648. Sharma, A., K.R. Jenkins, A. Héroux, and G.D. Bowman. (2011) Crystal structure of the Chromo-helicase-DNA-binding protein 1 (Chd1) DNA-binding domain in complex with DNA. J. Biol. Chem. 286:42099-42104. McKnight, J., K. Jenkins, I.M. Nodelman, and G.D. Bowman. (2010) Extranucleosomal DNA binding directs nucleosome sliding by Chd1. Mol. Cell Biol. 31:4746-4759.